Since I did a Sconces Part I, I feel a need to follow up with a Part II! As I mentioned in Sconces Part I, I have recently developed a love for sconces. I think that they add a special touch to a room, and are one of the details that make an interior exceptional. For a long time, I begged Joni from Cote de Texas to do a sconce post, as she uses them frequently in her designs. In response, she did an amazing post a few weeks ago. Her post really covered the design aspect of sconces; I am going to add a few pictures of inspirational sconces that are in my tear sheet file. Fine Art Lamps Sconce, from the Portobello Road Collection. This one was featured in the sconce article in House Beautiful. Currey & Company Sconces are beautiful. They are sold at many of the top design stores in Atlanta. 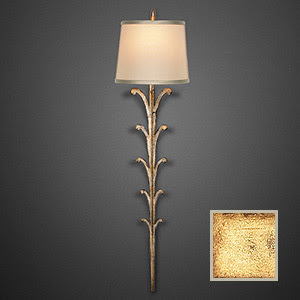 This sconce is called the Eden wall sconce. Vienna Sconce by Currey & Company. Definitely more of a traditional design, but would look great with contemporary art (a nice juxtaposition). This sconce is very similar to a much more expensive Vaughn sconce. There is something I like about this sconce. In the right place, it would be great. Made by Fine Art Lamps, Portobello Road Collection. David Iatesta's 'Fleur' sconce. I have seen this in person, and it is striking. There is a matching chandelier too. Suzanne Lovell design. Do you see the modern sconces on the stairwell? 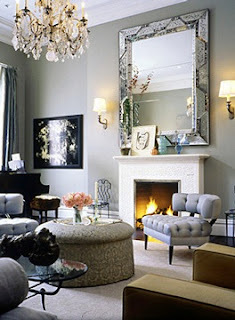 Although these are not sconces that I would use, I love the effect in this room. The sconces are by Moth Design (thanks for the tip, anonymous!). They add a great color and style component, and I appreciate that the color is repeated in the throw and pillow. I am not sure who to credit this picture to; my notes say 'WDR'. Interior design by EKB Interiors. 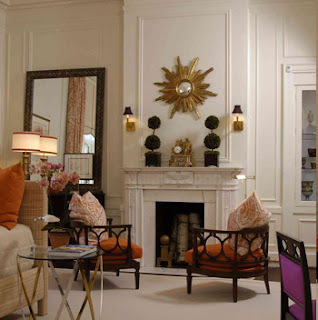 I think that the sconces above the fireplace are the 'Lur' sconce, by Laura Kirar for Baker (pictured above). Beautiful sconces flank a large mirror. Interior design by Fox-Nahem Design. Isn't this a beautiful scene? 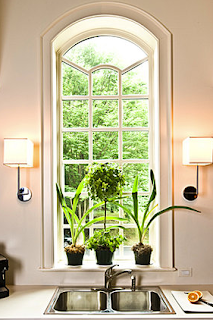 Sconces on either side of a window may seem redundant, as they are not really needed for their light, but they are very architecturally pleasing. Design by Whiteney Stewart. Interestingly enough, not very many of the rooms featured in my inspiration files (on my computer) have sconces. If I had it my way, every room in my house would have a sconce! esign is by Christina K. Tonkin. Perhaps they have google alerts set and they will read this! I think the red coral sconces are from Moth Design. I have seen them in white and silver and they are very cool. Anon - thank you so much for the Moth Design source! I am going to update my post. You know I spent an entire evening searching all my sources for the sconces. Nadda. So frustrating. I will keep an eye out. I'm a woman on a mission! Stunning sconces. I love the ones alongside the window. Very posh! I really looked the other night for the sconces you love - no luck. I'll try again! great post!! thanks for the shout out. Great sconces! Very dramatic in entries, staircases and flanking mantles, but I'd love some in my family room near the sofa so I can ditch the traditional table lamps. Reen, thank you for the comment! The Normandy sconce is featured in my Sconces, Part I post. It is the only ready made sconce I have seen that has a similar look and feel. Unfortunately, I hate the standard finishes that it comes in. So limiting!